Let us cast our minds back to the embryonic city of Melbourne on Saturday, 15 January 1842. Dawn has broken, the sun has risen and the temperature is set to reach its usual summer heights. From an early hour young men have been riding to their workplaces along the as yet unsealed streets of the town. 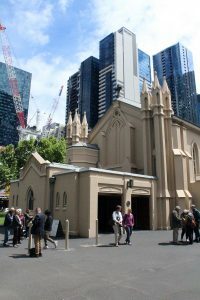 Some may have noticed that St Francis’ Church, on the corner of Lonsdale and Elizabeth Streets, was one of the few solid buildings in this place. A newcomer might have sensed a feeling of life and energy. This settlement was part of New South Wales and, as yet, all official business was conducted in Sydney. Melbourne City Council had not yet been formed and another five years were to elapse before Queen Victoria declared Melbourne to be a city. Yet it was a vibrant settlement comprising mostly young, free migrants from the British Isles. Among these was a group of youthful entrepreneurs who had called themselves the Twelve Apostles. Each had invested most of his money into a profit-making venture. Unfortunately for them, they made this move just as Melbourne was entering upon a financial downturn and most of them lost their investment. Apostle number four was one Alexander MacKillop who appeared to be doing very well. In 1841 he had paid 700 pounds for a house in Brunswick Street, Fitzroy, and at the same time, had acquired a property on the Merri Creek. He and his new wife, Flora, nee McDonald, had moved into the Brunswick Street house and settled into what promised to be a comfortable life. But before long, things went very wrong for him and his fellow Apostles. By 1844 he had lost more than 7,000 pounds and was declared bankrupt. He and his family lost their property on Merri Creek and their lovely home on Brunswick Street, and had to move away from that area and find shelter in a place they did not own. Very few of those who were living in Melbourne on 15 January 1842 could possibly have guessed that this was one of the most important days in the life of that town and, in fact, in the life of the Australian colonies, of neighbouring New Zealand and even beyond. 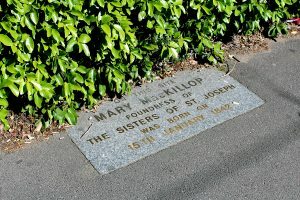 For this was the day when Flora MacKillop gave birth to her firstborn child, a beautiful baby girl whom she and her husband, Alexander, named Mary Helen. She was a beautiful child and right from the time of her birth, brought great joy to her family. As she grew older she proved most loving and helpful to her mother and her seven siblings. Her parents taught her well and by the time she was a young adult she had recognised that God was calling her to become one of the first members of Father Julian Tenison Woods’ new religious order, the Sisters of Saint Joseph for the Catholic education of children from poor families. She persevered in her calling and led the new order well. Then, after much opposition and many difficulties she made her home in North Sydney where she died on 8 August 1909. Today she is honoured as Australia’s first canonised saint and the work she and Father Woods began all those years ago has enabled hundreds of thousands of “children of the poor” to become well educated and has also offered shelter and healing to many hundreds of vulnerable women and children. What a life! And it began on 15 January 1842! Pay attention to all of the above, great city of Melbourne. Today you are being called upon to honour one of your most celebrated daughters. Take a holiday, have a party. She deserves it and so do you!